With the likes of distorted camera footage showcasing ruthless murders in the name of "justice," the PS Vita's newest visual novel Collar x Malice quickly sets the tone of its tense setting. One would be hard-pressed to find any trace of Idea Factory's romantic otome underpinnings until at least an hour in, if that. At least until a group of pretty males that were former officers join the fray to help you solve various murder mysteries. But even that does not bring much comfort considering just how cold they all are at the outset. 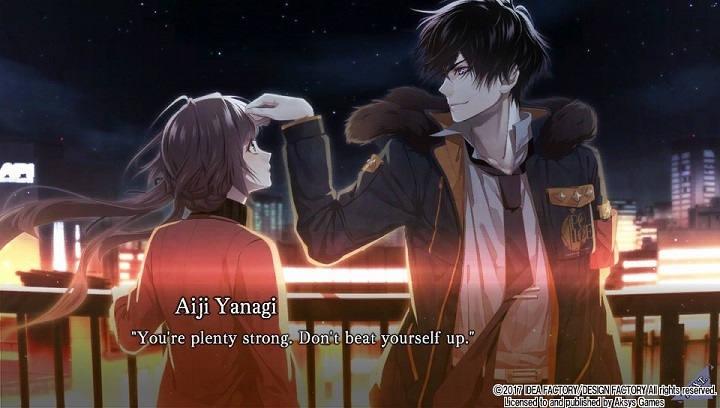 Collar X Malice is a visual novel structured around five different character routes (the last of which is locked until one completes the four others) with each tale standing well enough on their own. What is intriguing in how it is told is each story route has an entirely different focus and the many pieces to the overarching storytelling only really make sense upon finishing all of them due to their complex subplots. 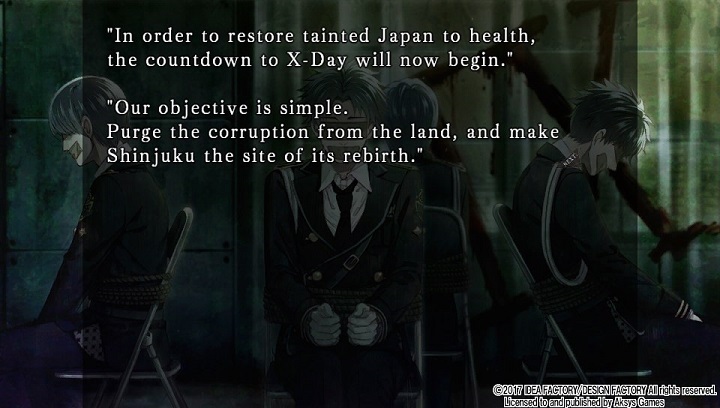 Though, one will have to be able to overlook a hokey story element or two to see it through (like how the Japanese government apparently thought it was a good idea to issue guns to all citizens during the Shinjuku quarantine?). 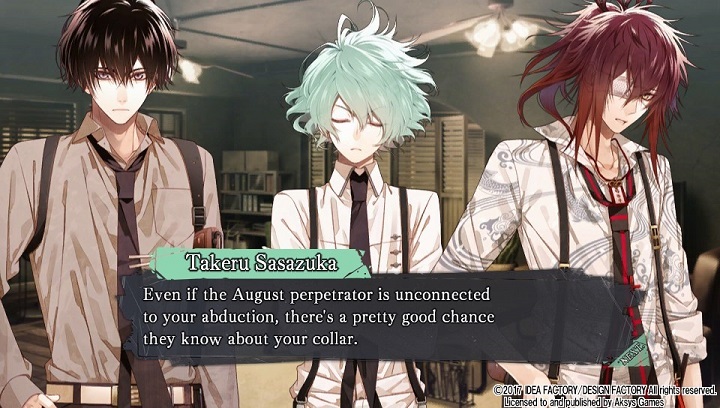 Collar X Malice is largely about investigating murder mysteries and conspiracies with a dash of romance interspaced between it all. Flowery otome fanservice is present, but generally speaking, it is the furthest thought from the primary cast early in. Each of the male leads has rather distinct personal objectives that give them plenty of reason to act cold to the main heroine (the same also applies in inverse). Because of this pretense, the trust that is gained between what is initially a business-only relationship feels much more organic than one would expect. My favorite of these character developments is the incredibly brash former officer of the cyber crimes division, Takeru. Though he is more than a bit haughty (aggressively so usually), his route is far more personal focused than most others in the entire game (except for maybe the eyepatch-wearing Mineo perhaps). For as prideful as Takeru may be, his side of the storytelling does a wonderful job of making him feel down to earth during the course of it. Also, he has some hilariously sassy quips at times, so that's a plus for me too. Some routes are certainly better than others, however. The one that personally took me the longest to shoulder on through, purely for thematic reasoning, was that of the Special Protections officer, Kei. Now, I like Kei enough as a character but I found his character route to be rather obnoxious. It encroached upon a trope that I dislike in otome games especially, which is the fixation of protecting the main heroine. Admittedly, the context behind Okazaki's seemingly selfless motivations unravels to have much darker implications over time. Still, one will hear some variation of the phrase "I will protect you" a nauseating amount of times. Of course, reminiscent of Code Realize: Guardians of Rebirth in this small regard, both characters and their narrative arc focus are extremely subject to taste and, occasional narrative grips aside, are told well overall in spite of excessively long banter at times. 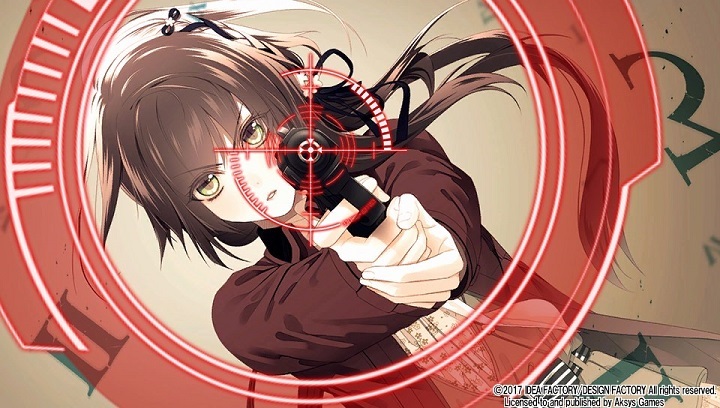 That said, there is actually more that goes on in Collar X Malice than thumbing through walls of story text and earning the hearts and minds of one's eventual male suitors as a game. Without a doubt, most of the progression stems from picking correct dialogue choices to properly reach a tale's conclusion and hoping they don't die in doing so. There are also instances of basic point & click-styled detective work and, surprisingly, an occasional gun-based quick-time-event to shoot down a prospective criminal. Speaking of which, there is an alarming amount of bad endings. Most bad endings usually not-so-subtlety apply the expression "curiosity killed the cat", but there are a few bad ends that are surprisingly meaningful to the overarching story despite not technically being required to see. For as much as the player is likely to stumble to their doom before reaching their desired conclusion(s), Collar X Malice is usually quite slick in how it is presented. The beautifully drawn character art is but one clear perk of it (unless one is uncomfortable with the occasional otome-styled fanservice scene. I'm not). The Japanese-only voice-acting is also really impressive, making each main character have a distinct presence throughout, though the main heroine herself is unfortunately unvoiced. Idea Factory proves yet again they have the visual novel interface thing down pat, for the most part. Godsends to the subgenre like fast-forwarding until reaching unread text, instant story scene rewinding, and various save options are all there and then some. However, the biggest replay tool of all, that being the chapter select, is not available until reaching a character's "true end". This is very important to keep in mind as I personally almost locked myself into a bad ending right before the finale of the last character route and was really close to a redundant VN fast-forwarding nightmare to fix it. While Collar x Malice is pretty good at implying that you are on the right path "for the most part" I'd recommend other's veer on the side of safety and follow a dialogue choice guide when they can just to get those true ends out of the way first. This is especially true since character routes themselves are only triggered through rigid and specific dialogue choices early in. Of Idea Factory's many otome visual novel offerings, Collar x Malice comes across as their most well-rounded. A fascinating, crime-based storytelling setup and a nuanced lead cast of characters make it easy to be drawn into its world, though various pacing mishaps and an inconsistent overarching storytelling emphasis placed upon certain leads do hold the game back from its full potential. But, all in all, Collar x Malice stands tall on its own and has the heart of a genuinely good visual novel, and it becomes quite rewarding to uncover the larger truth buried beneath its lengthy adventure. A gripping premise and cast of characters make it quite easy to forget Collar x Malice's occasional foibles in how it is told as a visual novel. Disclosure: This game was reviewed using downloadable PS Vita code provided by the publisher.